The pop superstar's single was released in late 2015 and his fans flocked to the video streaming site throughout 2016 to view the clip over and over again. Sorry garnered 600 million more hits on Vevo than Adele's Hello, another release from last year (15), which was a distant second in the 2016 end-of-year poll with 1.26 billion views. Fifth Harmony landed in third place with Work From Home, ahead of Calvin Harris and Rihanna's This Is What You Came For. 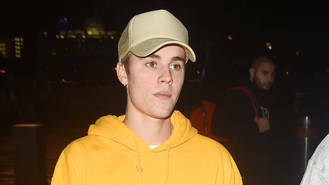 Bieber made two more appearances in the Vevo top 10 - What Do You Mean? and Love Yourself came in at numbers five and six, respectively. Drake's Hotline Bling, Mark Ronson and Bruno Mars' 2014 smash Uptown Funk, Rihanna's Work, and the Closer lyric video by The Chainsmokers round out the top 10. Each of Bieber's big hits featured on his 2015 Purpose album, which was considered a comeback release after a series of headline-grabbing incidents and run-ins with the law in recent years. His hard work paid off on Tuesday (06Dec16) when he earned four nominations for the 2017 Grammy Awards, with Purpose shortlisted for the coveted Album of the Year honour. He will face tough competition in that category from Adele's 25, Beyonce's Lemonade, Views by Drake, and A Sailor's Guide to Earth by Sturgill Simpson. Purpose is also up for Best Pop Vocal Album, while Love Yourself is in the running for Song of the Year and Best Pop Solo Performance.